Before going to the tutorial, we have to create folders and files in the structured way for the Angular js project. Please create the folders and the files like below. This is one of the ways we can create folder and files. As we all know AngularJS support MVVC and MVC. Before starting the project keep in mind, have to align the files to the respective folders. In our tutorial I’m using MVC. Please find the folder structure below. 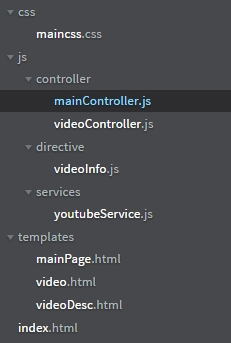 Once the folders and files are created, open the js/controller/mainController.js controller and place the below code. In the above code you will notice the “$sceDelegateProvider.resourceUrlWhitelist”. This will make sure if any cross domain URL / link is called the above code will take care of bypassing the error or warning. Here we can mention all the allowed url with mode as “safe”. In case if we want to block any URL in AngularJS project use the “resourceUrlBlacklist” instead of “resourceUrlWhitelist”. If you want to get more idea about allowing or blocking the URL from AngularJS project please look at this link. Open the controller and place the below code.